Joined the Franciscans at Voghera, Italy as a young man, but developed severe health problems and returned to his family. Studied under Saint John Bosco at Turin, Italy, was present at Saint John's death, and was cured of his illness during Saint John's funeral. Studied at the seminary in Tortona, Italy. While still a layman and student, he opened San Luigi House at San Bernardino in 1893, a home for the poor, homeless and abandoned. Ordained on 13 April 1895. Founded the Hermits of Divine Providence congregation, the Ladies of Divine Providence, and an orphanage in Rome, Italy in 1899. Under the patronage of Pope Saint Pius X, he founded the Little Missionaries of Charity. Constructed the Marian shrine at Tortona, a site that became a rallying point for people during times of political unrest. To administer the houses of his congregations, Luigi travelled the world, visiting houses in Wales, Brazil, the United States, and throughout Italy. Eleven Christians who were martyred in succession in a single incident during the persecutions of Diocletian. First there were the eight imprisoned Christians, Domna, Esmaragdus, Eugene, Hilary, Mardonius, Maximus, Mígdonus and Peter, about whom we know little more than their names. Each day for eight days one of them would be strangled to death in view of the others so that they would spend the night in dread, not knowing if they were next. Peter was the chamberlain or butler in the palace of Diocletian. When he was overheard complaining about this cruelty, he was exposed as a Christian, arrested, tortured and executed by having the flesh torn from his bones, salt and vinegar poured on the wounds, and then being roasted to death over a slow fire. Gorgonio was an army officer and member of the staff in the house of emperor Diocletian; Doroteo was a staff clerk. They were each exposed as Christians when they were overhead objecting to the torture and murder of Peter. This led to their own arrest, torture and executions. Born to the nobility, Giustina grew up in a wealthy household. As a child, she frequently fasted on her own, and had a habit of hiding away to pray. She was drawn to the religious life, but her parents strongly opposed it, not wishing to lose their only daughter to the cloister. However, her father fell seriously ill, and during his recovery time he meditated on what was and was not important in life. This led him to give his blessing to Giustina becoming a nun. She began her Benedictine novitiate at the monastery of San Marco at age 12; legend says that a dove landed on her as she walk into the convent, and all took this as a sign of blessing from the Holy Spirit on her choice. Feeling the need for more solitude, with her bishop‘s permission she became a hermitess and anchoress. She lived in isolation for 35 years; legend says that when wolves would gather around her hermitage, an angel would drive them off. In later years, her health began to fail, she became blindess, and she was forced to return to live in the convent. When the convent became unsafe due to civil unrest, she returned to her family home in 1315, and spent her remaining years there. Subject to ecstasies and received visions. A clever and inquisitive boy, he was much attracted to Taoism in his youth. He moved to Guiyang in 1794, and entered the silk business. Through a business contact, he first learned of Christianity. He converted, but was unable to join the Church because, in the custom of the day, he kept a concubine. He eventually left her, and in 1800, against strong opposition from his family and business associates, he joined the Church, taking the name Joseph. Because of trouble at his business over his new-found faith, he went out on his own, opening his own store. He began a ministry of preaching and teaching, and converted a house into a small school for religion. He became a school principal in 1808, and worked as a catechist and altar server. During the anti-Christian persecutions led by the White Lotus Cult, Joseph went briefly into hiding, but continued his catechist work covertly. In 1814 he was betrayed by his anti-Christian brother-in-law, and was arrested. He was lodged with Saint Peter Wu Gousheng, and the two spent their prison time ministering to other prisoners. He was offered his freedom if he would denounce Christianity; he declined. Martyr. Daughter of Salaw Bartlomiej and Ewa Bochenek, the youngest of ten children in a pious tradesman's family. She received two years of formal education, and at age 12 began work as a domestic in nearby homes. On 27 April 1900 she joined the Saint Zita Assocation, a religious group for maids. Within this church-centered place, Angela felt at home, and devoted her free time to the house, the church, and a call to religion, attending Mass daily and in routine contact with Franciscans. She was unable to enter religious life due to poor health, and continued to work as a maid and to mentor other young women. She became a Franciscan tertiary on 15 March 1912. Worked as a nurse in a Krakow hospital during World War I, spending her own money and any that she could beg to buy better food for injured soldiers. In 1917 her health collapsed completely; she spent the last five years of her life in a small room, surviving on the charity of the Saint Zita Association, and spending her time in prayer. Born poor, and though she stayed that way, she still found ways to help those in worse shape that herself. A pretty girl, she lived as a hermit in her home, doing chores, giving to the poor when she could, spinning, sewing, and praying through the nights. Seraphina's father died when the girl was very young. Soon after, she was stricken with a condition that made any movement painful; she had to be carried everywhere on a board. Fina lived the rest of her life in constant suffering, and neglect, which she turned over to God in her constant prayers. She never joined an order but lived her life under Benedictine Rule. Devoted to Saint Gregory the Great who suffered from a condition like hers. She received a vision from Saint Gregory who foretold the date of her death. Born a Romano-Briton prince, the son of Perphius, a Welsh chieftain. Educated at Llantwit Major with Saint David of Wales, Saint Samson of York, Saint Gildas the Wise and Saint Illtyd. Hermit. To escape being made a bishop, he and 12 companions established a monastery at Porz-Pol, Ouessant Island, Brittany (part of modern France. He later relented and became bishop of Ouismon. 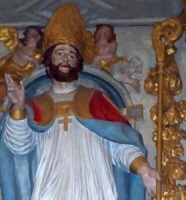 Spiritual director of his nephew, Saint Joavan of Brittany. Legend says that Saint Pol subdued a dragon on the Île de Batz by wrapping his clerical stole around the animal's neck, then used his bishop‘s crozier to drag it to the north edge of the island and ordered it to disappeared into the sea. Abbot of Fahan (Othan Mor), appointed by Saint Columba. Friend of King Hugh of Ireland. Spiritual teacher of Saint Laserian of Leighlin. Member of the O'Neill clan. Writer of a number of works including a rhymed biography of Saint Columba. In the ruined church of Saint Mura at Fahan is a beautiful Irish cross, and nearby is Saint Mura's Well. Educated at the Byzantine imperial court. Married layman. Both he and his wife entered religious life. Founded two monasteries. Abbot at Mount Migniana abbey. Wrote a Chronography, a sort of abstract of history from 284 to 813. Arrested, tortured, and exiled to Samothrace by Leo the Armenian for opposing iconoclasm. Son of a Roman army veteran. 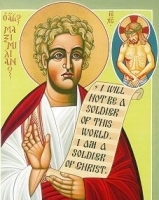 Conscientious objector - when drafted into the Roman army, he refused to serve on the grounds that his faith prohibited it. Martyred for this stand. Priest. Member of the Hermits of Saint Augustine, and lived in their convent in Recanati, Italy. Worked as a peacemaker between warring Italian political and military factions. Studied at Monte Cassino Abbey; spiritual student of the abbot who later became Pope Victor III; fellow student of Saint Peter Damian. Priest. Counselor and chaplain to prince Jordan of Capua, Italy. Bishop of Forum Claudii, Italy, consecrated on 21 March 1087; he moved the see city to Carinola, Campania, Italy in 1100. Dominican nun in 1262 at the convent of Engelport in Hundsrück, Germany. All the nuns at the convent became Premonstratensians in 1272. Beatrix may have served as the first prioress. Relative of Saint Dunstan of Canterbury and Saint Ethelwold. Monk. Bishop of Winchester, England in 935. Great supporter of the monastic life. Ordained Saint Dunstan and Saint Ethelwold. Born to the royal family. With her sister Digmund, she founded the convent of Wetter in Oberlahngau, Germany, and served as its first abbess. Benedictine monk. Friend, spiritual student and secretary to Pope Saint Gregory the Great; Gregory dictated four books of the Dialogues to Peter. 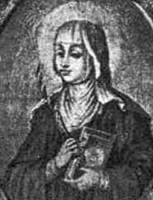 First nun to take vows in Northumbria (part of modern England), consecrated by Saint Aiden of Lindisfarne. Founded a convent at Hartlepool, Northumbia, and later another at Healaugh, Northumbria. Spiritual student of Saint Columbanus. Went with Columbanus to evangelize in Scotland. Martyred in the persecutions of Diocletian with seven other Christians. Monk. Abbot of Iona Abbey. Martyred by Saxons while travelling to Rome, Italy. Married to a man named Felicius. Martyred, date unknown.